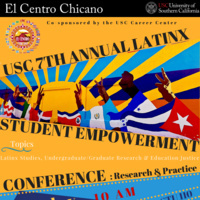 The 7th Annual USC Latinx Student Empowerment Conference: Research & Practice is presented by El Centro Chicano, USC Latinx Student Assembly (LSA), USC American Studies & Ethnicity (ASE), USC Sociology, Center For The Study of Immigrant Integration [CSII], the USC Latino/a Graduate Student Association (LGSA) & USC School of Rossier. Co-sponsored by the USC Career Center. This conference aims to support the research, academic success, and social justice activism of USC students. The Conference is open to current USC students both undergraduate and graduate and welcomes new spring admits! We also welcome & encourage USC Alumni to attend! We welcome & encourage all current USC undergraduate and graduate students, including spring admits to RSVP! We also ask USC Alumni, Staff, Faculty & El Centro friends to RSVP here too: https://goo.gl/forms/P6iYmJsebCxvMYeE3. RSVP BEFORE/BY FRIDAY JANUARY 19th by 12NOON. **Check-in will begin at 9:15 a.m.
Keynote speaker was on target! Very inspiring and empowering message of what is being trauma informed, as well what self efficacy looks like. Excellent event throughout!